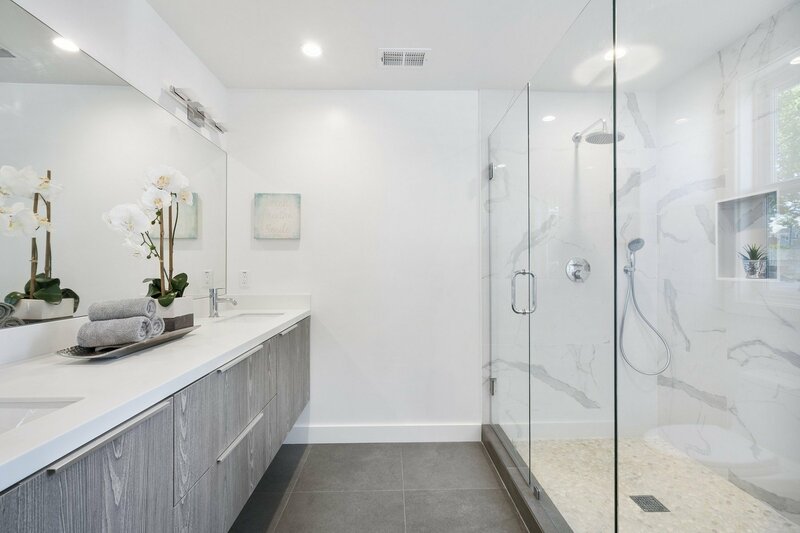 When you’re helping a client visualize the bathroom of their dreams, it can be hard to align their expectations with reality. Fortunately, Pinterest has become an invaluable tool for helping customers and designers find common ground on designs that are both achievable and exceptional. These boards featuring stylish interiors will help you design a Pinterest-worthy bathroom in no time. Interior designer Sarah Van Peteghem put together this drool-worthy Pinterest board for bathroom inspiration. The founder of Coco Lapine Design, Van Peteghem is a Belgian designer based in Munich and is known for her utilitarian bathrooms and kitchens. This board features muted grays, marbles, slate and subway tile in high-contrast patterns, showing just how much Lapine appreciates understated, modern designs. Whether you’re remodeling an older home or looking to infuse vintage design into a modern bath, this is one of the best vintage bathroom boards on Pinterest. We especially love how The Blue House Blog incorporates vintage patterns and colors, especially those that are realistic in older homes — even though they might not be traditionally popular in modern design. Eden Passante is a home and entertainment blogger with impeccable taste in interiors. Her Pinterest board, Bathroom Inspiration, is filled with feminine touches of pink, blue and rose gold. These colors are balanced with exotic tiles and textiles that help inspire a glamorous, yet laid-back vibe that would work well in homes of all styles. If you’re a fan of the fresh, effortless bathroom look, check out the Bathroom board by New Darlings. The wildly popular lifestyle blog is run by Robert and Christina Martinez, and their sense of style certainly shows through on Pinterest. Follow this board for a heaping dose of fresh whites, rose-toned hues and vintage pops of patterns that don’t dissapoint. Looking for a bold, offbeat approach to bathroom design? Follow Fritha Tigerlilly Quinn’s Bathroom Inspiration board on Pinterest for a colorful and artful approach. This board does include some of the fresh whites and brass fixtures that are popular across the globe right now, but it’s also filled with eclectic wallpapers, plants, tiles, textures and accessories that can inspire out-of-the-box designs. As the founder of the popular lifestyle blog The Effortless Chic, blogger and digital content creator Jen Pinkston has an eye for beautiful, standout style that turns heads. Her bathroom board assumes the monochromatic simplicity that is popular across many modern interiors today. However, many of her pins also feature eclectic patterns and world-inspired textiles that keep things fresh. London lifestyle blog Homegirl London is one of the foremost thought leaders on life and style in England’s big apple. In this board, Homegirl London showcases all the glitz and glamour that reigns true across modern design — albeit with a British twist. You’ll find invigorating approaches to industrial bathroom design mixed with modern reinterpretations of vintage decor. Interior and textile designer Caitlin Wilson is the author of this pattern-happy board. From eccentric wallpapers to exotic flooring, this board doesn’t shy away from color and design that shines. If you’re looking for inspiration that’s classy and colorful and never ordinary, don’t wait to follow Wilson’s board. Inspired by clawfoot tubs? Follow this board by photographer Tracy Fowler for endless inspiration on interiors featuring beautiful baths. This board is unique because showcases all different types of freestanding tubs — and how they can be styled. From lush jungle-like baths to copper-colored elegant tubs, you’ll find no shortage of inspiration here. At Home in Love founder Aileen Allen created this gorgeous Pinterest board, with lots of ideas for creating the modern bathroom. Allen’s board contains all the sleek black and white elements, such as subway-tiled showers and black-rimmed mirrors, but these images are mixed with warmer elements like wood and gold that keep the ambiance comfortable and grounded. Looking for an effortless, DIY approach to bathroom glam? This board by Molly Madfis has all that — and more. We love the fresh, clean aura exuded in the photos on this board, especially because they feel so different. Look for unexpected textures, lush plants and soft wood grains; they abound on this homey and eclectic collection. Heather Hands, author of the fabulous lifestyle and cooking blog Flourishing Foodie, compiled this lovely board on all things bathroom design. From tiny tiled powder rooms to artistic toilet paper holders, this board overflows with images that focus on the tiny details. Follow Flourishing Foodie if you’re a big fan of exotic patterns and color palettes. As the maker of hand-painted wooden signs for the home, Aimee Weaver is passionate about bringing rustic, handmade elements into spaces of all sizes. Weaver’s bathroom board reflects this approach, featuring a solid dose of wooden vanities, reclaimed dressers and vintage elements. Follow this board to see farmhouse chic done right. We love the down-home, DIY-glam approach of Abby Smith’s Bathroom Inspiration Board. As the founder of the blog Twist Me Pretty, Smith is an expert on all things beautiful and functional. This board is filled with bathroom organization hacks and clever decor ideas that’ll inspire you to think about bathroom interiors in a whole new way. Summer Adams is an interiors and lifestyle designer with a flair for French country design, shabby chic decor and glamorous details. On her Bathroom Inspo Pinterest board, which features over 3,100 pins, you’ll find a seemingly endless collection of bright, fresh bathrooms to inspire your next design. Gina Luker is a DIY blogger and the founder of the popular home and lifestyle blog, The Shabby Creek Cottage. From rustic, hand-painted mirrors to upcycled trough sinks, Luker’s bathroom inspiration Pinterest board is a great starting point for inspiring shabby chic interiors and farmhouse glam designs. Dusty pink details meet monochromatic patterns on this Pinterest board by home and family blogger Catherine McCourt. Here, you’ll find a balanced mix of both contemporary and retro-inspired bathroom designs. McCourt is an expert in creating family-friendly spaces, and the designs on this board will keep ideas for family bathrooms popping. British interior design blogger Stacey Sheppard is the author of this inspiring bathroom board on Pinterest. A thought leader in the interior design space — as seen through her blog The Design Sheppard — her expertise shines through in this collection. Follow it for an eclectic mix of styles, including classic decor elements and modern color schemes. Sometimes looking at textures, natural materials and color schemes is the best way to inspire a dream bathroom. That’s exactly the approach taken by interiors stylist Joanna Thornhill on her Beachy Bathroom project board, which undoubtedly has helped inspire many relaxing seaside retreats. From beach glass to candles to fresh linens, we love the simple approach of this board. Photographer and lifestyle blogger Mary Summers has a standout sense of interior style. We’re gushing over her Bathroom Inspiration Pinterest board with its bold, marble sinks, commanding brass fixtures and sophisticated patterns. Follow Mary Summers when creating a bathroom that inspires a happy, motivated life.